There is a wide range of defence and attack strategies: some animals live hidden in natural holes or other hideouts made by themselves, feeding on the suspended materials carried by the currents. Other species get out only at night, others are mimetic or have stinging or poisonous substances or even pricks or shells. On the contrary, predators have found their ways to cope: they can see very well at night, are resistant to poisons and repellents, possess attacking skills, such as the powerful claws of some crabs that can break up carapaces or the siphons of some molluscs that can pierce shells. Beaches are often dotted with shells with a tiny, mysterious hole on one side, which is the result of the attack of one of these molluscs. The showy, fringed scorpion fish (sp. Pterois), a relative of the Mediterranean Scorpaena, despite looking meek because of its slow movements, is capable of sudden and lethal attacks with its long and poisonous spines used both for attacks and defence. The false cleaner fish deceives its preys by imitating the true cleaner fish and, instead of supplying this precious cleaning service, takes strips of flesh off its victims. The barrier is home to incredible cases of symbiosis such as the one between the amphiprion and the sea anemone: this little fish finds safe shelter among the tentacles of the anemone which are stinging and lethal to all other animals, except this little fish. 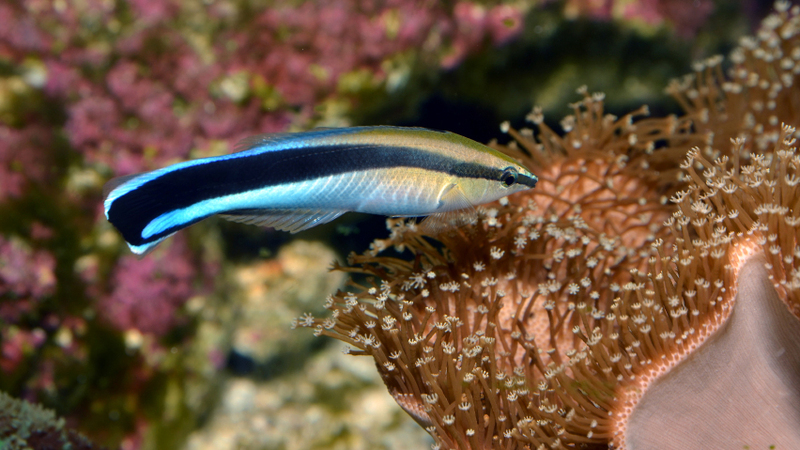 In return, the amphiprion offers the anemone a thorough “cleaning” to rid it of any food residues or parasites.